*Note: In this article, I talk extensively about the University of Alabama football team. If you have an aversion to broadcasts or publications covering the Crimson Tide, you’d better not read this article. On Thursday, the Cleveland Browns officially announced Freddie Kitchens as the 22nd head coach in the team’s history and the 12th since 1999. And although Kitchens’ rise to prominence in Cleveland seemingly happened at rapid speed, going from running backs and associate head coach to head coach in a matter of months, the 44 year-old has been building to this moment for decades. And what the Browns like about Kitchens and his personality, what caused them to hire him as head coach despite only having eight games of NFL play calling experience finds its roots in the mid-1990s, in the town of Tuscaloosa, Alabama. In 1992, as the University of Alabama Crimson Tide was on its way to posting a season record of 13-0, beating the Miami Hurricanes in the Sugar Bowl 34-13 and winning the National Championship, third-year Alabama Head Coach Gene Stallings recruited a young man from the city of Gadsden, Alabama to come play quarterback for his team. Ultimately, Freddie Kitchens would not be able to pass up on the opportunity to don the UA uniform and play for one of the most successful college football programs in history and he joined the Crimson Tide football team for the 1993 season. And although Alabama was coming off a national championship run, that 1993 season would turn out to be more tumultuous than neither Kitchens nor anyone else expected and the experience would help Kitchens learn to how to react to adversity later in his football career. Just like the year before, Alabama went into 1993 with high expectations. Freddie Kitchens, on the other hand, would not fit into the team’s immediate plans, filling the third-string quarterback role behind future NFL quarterback Jay Barker and Brian Burgdorf. Even wide receiver/rover David Palmer, destined to play for the Minnesota Vikings from 1994-2000, threw double the passes Kitchens did that year, completing 15 of 30 compared to Kitchens’ 7-14. This sparse amount of playing time, coupled with the fact that he still wouldn’t be a starter the next year, caused Kitchens to choose to red-shirt for the 1994 season. While Alabama hadn’t gotten back to the National Championship Game and lost three games in 1993, the Crimson Tide still finished at Number 13 in the Coaches Poll and beat North Carolina in the Gator Bowl to end the year. There had been a few bumps along the road, but Alabama would be fine. Officially, Alabama had gone 9-3-1 in 1993 and that’s how everyone assumed the record would forever stand. After all, what could possibly change something like that? The player who’d signed with an agent was, of course, Langham. Due to his infraction, the NCAA chose to punish Alabama by taking away any wins or ties the Tide had from 1993 in games in which Langham played and making them losses. Alabama’s original record for that season was 9-3-1, but after the stripped wins, the new official record would become 1-12. Antonio Langham would go on to play in the NFL, being drafted by the Browns in 1994 and starting 76 games over a seven-year career. Langham, who was in Cleveland from 1994-95 then again in 1999, also holds the distinction of being one of only two NFL players to play for both the original Browns and reactivated Browns (the other is Orlando Brown). Langham holds a strange place in the histories of both the Alabama football team and the Cleveland Browns. If nothing else, the fact that Freddie Kitchens played with Langham, an important member of the Browns’ past, is just one more reason to get on board with this guy as head coach. For the 1994 season, Alabama’s scholarship count was restricted and it was ineligible for a bowl game (these sanctions imposed upon the Tide weren’t entirely due to Langham having an agent while still in college; Alabama had other stuff going on as well). But Freddie Kitchens sat out the entire 1994 season thanks to his red-shirt, so he felt the sanctions less than others. By the time 1995 rolled around, though, Kitchens was ready to play a larger role in the Crimson Tide offensive scheme. However, senior Brian Burgdorf would have something to say about that. Burgdorf and Kitchens would share time behind center that season, with the former participating in nine contests compare to the latter’s seven. Their combined effort would result in a final record of 8-3, normally good enough for a trip to a postseason game. With the NCAA sanctions that had been placed on the Crimson Tide, though, Alabama and Freddie Kitchens were prohibited from going bowling that season. On a personal front, Kitchens certainly received more opportunities to prove himself that year than in 1993. Only completing seven passes in ‘93, Kitchens completed 63 on 127 attempts for 811 yards in 1995. His five interceptions were only two below Burgdorf’s, who attempted a total of 162 passes on the season. But he had Burgdorf beat in rushing, picking up 53 yards on the ground on 50 attempts to Burgdorf’s 48 yards on 68 attempts. Just as Kitchens was ascending, Burgdorf was leaving, creating a vacuum at the quarterback position for Alabama. Freddie Kitchens was about to receive the best opportunity of his collegiate football career to date. In 1996, Freddie Kitchens, a red-shirt junior, became the undisputed number one quarterback of the Crimson Tide football team, starting 12 games. His seven passing yards per attempt were seventh in the SEC that season and his 152 pass completions were fifth in the conference. Kitchens’ 14 touchdown passes would also become his best all-time, although those TDs did come along with 14 interceptions. Even still, Kitchens led the team to success in 1996, highlighted by a 26-0 win on the road at #11 LSU coming off a loss to #6 Tennessee. The season was capped off on New Year’s Day by a victory over Michigan in the Outback Bowl, at which point Alabama Head Coach Gene Stallings, who’d held that position for years, including during the 1992 championship season, stepped down. When Kitchens was hired by Cleveland to be its head coach earlier this month, Stallings went on the “Bull and Fox” show on 92.3 The Fan and had nothing but compliments for his former player. “The thing that impressed me from Day 1 about Freddie was his toughness,” Stallings said. “A lot of people who play quarterback are not as tough as some of the other positions, but Freddie was extremely aggressive and tough. 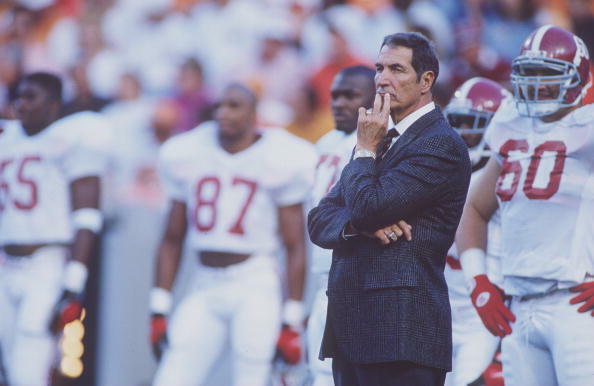 Stallings was with Kitchens for four years in Tuscaloosa, but in 1997, that run would come to an end. Stallings retired and in came Mike DuBose. DuBose had been elevated from within, having coached the Alabama defensive line from 1990-96. More important, though, was who DuBose brought with him. Bruce Arians had been a position coach in the NFL in 1996, working with the New Orleans Saints’ tight ends. But in 1997, Freddie Kitchens’ senior year, Arians would become the offensive coordinator at Alabama. Overall, the experiment blew up for Alabama. After putting up winning seasons for the duration of the time Kitchens had been on campus up to that point, Alabama could only muster a meager 4-7 record in 1997, giving Kitchens a sour note on which to end his collegiate career. In terms of his own statistics, Freddie’s numbers were a mixed bag. On one hand, his interceptions were down significantly, dropping from 14 in 1996 to four in 1997. At the same time, though, his passing attempts were down, his yards and average yards per attempt were down and his touchdowns were down. Alabama lost its last four contests of the year, the first three of which being home games and Bruce Arians left Tuscaloosa after one year, returning to the NFL to coach Peyton Manning and the rest of the Indianapolis quarterbacks. Kitchens, meanwhile, didn’t throw his hat into the ring in the professional ranks, at least, not as a player. Looking to break into coaching himself, Kitchens went to Glenville State in 1999 to begin his second career. It wouldn’t be until 2013 that Kitchens and Arians were reunited. Arians had bounced around the NFL but found himself back in Indianapolis in 2012. He started the season as a coordinator, but when head coach Chuck Pagano had to step away to attend to his health, Arians filled in nicely on an interim basis, leading the Colts to the playoffs and winning the AP Coach of the Year Award. He used that success to land himself a permanent head coaching gig with the Arizona Cardinals, the team for which Freddie Kitchens had been a coach since 2007. Kitchens was the quarterbacks coach for Arizona for his first four years under Arians, and was the running backs coach in 2017. Following that season, Arians departed Arizona and Kitchens did as well. And while Arians made for the broadcasting booth, Kitchens ended up as running backs coach for the Cleveland Browns. A few events subsequently transpired that I don’t think I need to tell you about and within a year, Kitchens had become the new head coach of the Browns. Without those years at Alabama, Freddie Kitchens would never have gotten the head coaching job with the Browns. That’s where Kitchens learned what it took to play quarterback at a high level in the competitive SEC. Kitchens battled through adversity to become one of the greatest quarterbacks in school history. And one piece of adversity even turned out to be a blessing in disguise. Remember when Kitchens decided to red-shirt his sophomore year because he knew he wouldn’t get much playing time? At the time, that must have been a difficult decision for Freddie. But now, as he looks back, he surely sees the good that came from that choice. Red-shirting that 1994 season gave Kitchens one extra year of eligibility, allowing him to still be around at Alabama when Bruce Arians showed up in 1997. Arians has been a vital cog in the development of Freddie Kitchens as a football man, both as a player and a coach. Had they not connected on that bad Alabama football team in 1997, who knows if Kitchens would have ever become what he is today and gotten the opportunities he’s been given. Freddie Kitchens has only been employed by the Cleveland Browns since 2018, but his life in football dates back decades further. All of his experiences and accumulated knowledge will come into play when he leads the Browns into battle starting in 2019. So when you look at Kitchens, keep his days at Alabama in mind. They’re a big part of who he is, and for the Browns to be successful under Kitchens, he’ll have to use those experiences to his advantage. Previous articleCollege Ball Show: Preview-Predictions-Banter-Recap! Kentucky/Kansas UNC/NCST, MSU/Purdue, & More!